376 pages | 3 B/W Illus. 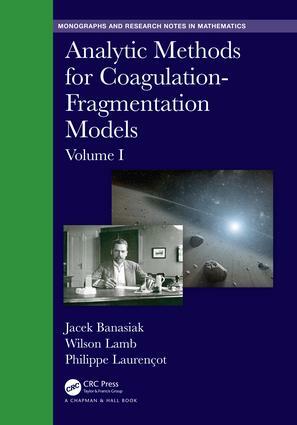 Analytic Methods for Coagulation-Fragmentation Models is a two-volume set that provides a comprehensive exposition of the mathematical analysis of coagulation-fragmentation models. Initially, an in-depth survey of coagulation-fragmentation processes is presented, together with an account of relevant early results obtained on the associated model equations. These provide motivation for the subsequent detailed treatment of more up-to-date investigations which have led to significant theoretical developments on topics such as solvability and the long-term behaviour of solutions. To make the account as self-contained as possible, the mathematical tools that feature prominently in these modern treatments are introduced at appropriate places. The main theme of Volume I is the analysis of linear fragmentation models, with Volume II devoted to processes that involve the nonlinear contribution of coagulation. Jacek Banasiak is a Professor of Mathematics at the University of Kwazulu-Natal, Zimbabwe. His main research areas are functional analytic methods in kinetic theory and mathematical biology, singular perturbations, general applied analysis and partial differential equations and evolution problems. He is the author/co-author of 5 monographs and over 100 papers in these fields. He is also Editor-in-Chief of Afrika Matematika (Springer). In 2013 he was awarded the Cross of Merit (Silver) of the Republic of Poland. Wilson Lamb is a Senior Lecturer at the University of Strathclyde, Scotland. His main interests lie in Functional Analysis, Applied Analysis, Evolution Equations, Mathematical Analysis of Coagulation and Fragmentation Processes. He has published over 45 refereed research publications. He has given lecture courses at all levels to Mathematics degree students and to Science and Engineering students. These include courses on elementary calculus and algebra, discrete mathematics, multivariable calculus, linear algebra and vector space theory. He was nominated for the University of Strathclyde Students’ Association Teaching Excellence Awards in 2012, 2013 and 2014; in 2013, he was shortlisted for the category of “Best in Science Faculty”. Philippe Laurençot is the Director of research (senior researcher) CNRS 1, Institut de Math ematiques de Toulouse, Universite Paul Sabatier. His main research interests include the mathematical analysis of evolution partial differential equations,dynamical system approach to evolution partial differential equations, coagulation equations and mathematical models in biology. He is the author of over 170 scientific publications and has given invited talks all over the world.